A gold rectangular hinged case containing an address to Albert Edward Prince of Wales on silk. The centre of the lid is decorated with the Prince of Wales's crest of three feathers and the motto 'Ich Dien', and inset with three rubies and a diamond. 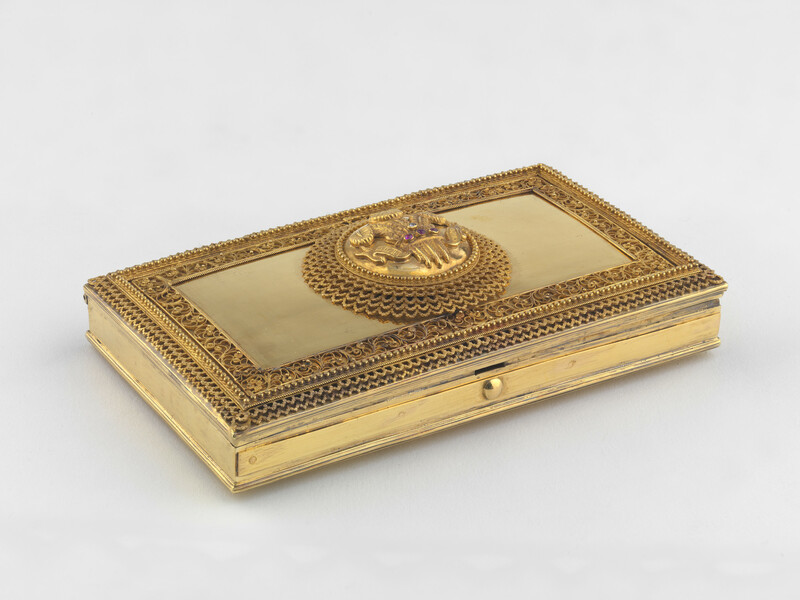 The lid is further embellished with gold wirework and granulation. These decorative metalworking techniques involve the high-skilled application of gold wire and grains, for which Tamil goldsmiths working in Sri Lanka were particularly renowned. The cream-coloured silk address is decorated with the Prince of Wales's crest and 96 flowers made of gold.